Scrawled on well-worn blue jeans are a man’s name, social security number, blood type, wife’s name, hotel where she was evacuated for safety and the hotel phone number. Claudio Hemb wanted to ensure that his body would be identified and his family notified if he perished in Hurricane Katrina’s floodwaters. The exhibit, “Living with Hurricanes: Katrina and Beyond” at the Louisiana State Museum in New Orleans’ French Quarter, brings home the devastating power of hurricanes. Located on Jackson Square, the museum is a popular stop for riverboat passengers when they embark or disembark for their cruises. Hurricane Katrina in 2005 and the aftermath flooded 80 percent of New Orleans and took an estimated 1,500 lives. Opened in October 2010, the permanent exhibit greets visitors with a powerful emotional punch beginning with the lobby of the circa 1791 Presbytère building. Originally the residence of Capuchin monks, the Presbytère became part of the Louisiana State Museum in 1911. 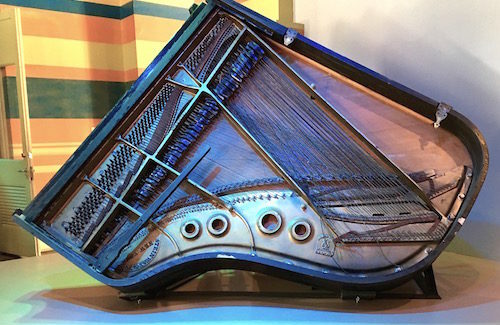 Positioned exactly as it was when floodwaters destroyed his home, a ruined Steinway baby grand piano that belonged to legendary New Orleans musician Fats Domino is a lobby centerpiece. For days after Katrina hit, people feared the rock-and-roll pioneer had died when his Lower Ninth Ward home was flooded to the roof. A well-known homebody, Fats Domino and his wife Rosemary didn’t evacuate before the hurricane but were later rescued by boat and taken to a shelter in Baton Rouge. Almost everything the couple owned was lost. Fats Domino died Oct. 24, 2017, at age 89. Colored stripes on the museum lobby walls depict water levels reached by the rising waters. Standing beneath the lines is a stark reminder of how people became trapped and drowned. The ceiling is hung with hundreds of glass bottles filled with notes in homage to those who perished. Blue glass hands interspersed among the bottles honor volunteers who came to the city to help in the rescue and rebuilding. Four galleries inside the museum contain artifacts, dramatic footage and interviews with survivors. In the first gallery, visitors learn the geographical facts about living in a city that is below sea level and surrounded by water. Visitors move through an Evacuation Corridor overhearing residents’ voices weighing options as Katrina approaches. A state-of-the art Storm Theater shows Katrina’s full fury with dramatic footage of the hurricane onslaught. Gallery Two takes visitors past a leaking floodwall and into an attic and onto the roof of a house surrounded by rising floodwaters. When his family evacuated to Houston as Katrina bore down on New Orleans, Claudio Hemb stayed behind to secure his French Quarter business. The day after Katrina devastated the city, Claudio set out on bicycle to reach his Lakeshore home about seven miles away, inking vital info on his pants in case he didn’t make it. Fortunately, he did. Framed in a glass shadow box is a hatchet that a mother and daughter bought two days before Katrina. Trapped in the small attic of their St. Bernard Parish home, the two used that hatchet to chop through the roof to be seen and rescued by boat. On the “Mabry Wall,” housing complex resident Tommie Elton Mabry wrote on his apartment walls with a black felt tip marker to record his ordeal starting with the day before Katrina hit and continuing for weeks afterward. Museum staff preserved his journal before the building was demolished. A mud-encrusted teddy bear illustrates the personal possessions that were lost and the hope that former owners of those beloved items survived the catastrophe. A garage door shows the markings of rescuers who note that two cats and one dog were found dead inside. “Do not remove. Owner will bury,” says a red painted message. Seats from the heavily damaged Louisiana Superdome are a reminder of where an estimated 35,000 people sought refuge and rescue. “The number of people combined with the stifling heat and the breakdown of plumbing systems created notoriously miserable conditions as the sports stadium came to symbolize failed emergency response systems,” a placard notes. Gallery Three explains the forensics of Katrina and shows through digital animation how the levees failed. “The levees failed because of poor design and poor construction,” Karen says. An estimated 70 percent of New Orleans occupied housing was damaged by Katrina. Gallery Four deals with recovery and promotes preparedness. “Seeing what happened here brought up discussions on how disasters are handled,” Karen says. 1. 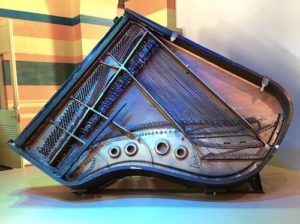 Fats Domino’s piano is displayed exactly as Katrina left it.